Demand is high for English language translators to subtitle Netflix movies, interpret at court proceedings, label food packages and medical supplies, and help multinational corporations hit their PowerPoint presentations out of the park. The U.S. Bureau of Labor Statistics projects jobs for translators and interpreters (who work with the spoken word) will have grown 29 percent from 2014 to 2024. For companies and organizations worldwide, getting the English right means the difference between success and, well, looking strange. And as world markets interconnect, it also means keeping consumers safe through clear and accurate labels and signs. Saint Rose is responding to demand, offering a Certificate in Spanish < > English Translation – to train those with strong linguistic skills to translate to and from both languages. Students pursuing the certificate have opportunities to translate in community settings. They translate and proofread general and specialized texts and use advanced technology, including subtitling and dubbing videos. Earning the certificate prepares them to become a professional translator, a community interpreter, or both. They are able to do so while leveraging their majors across the disciplines. And, with additional training, they may also become court or medical interpreters. 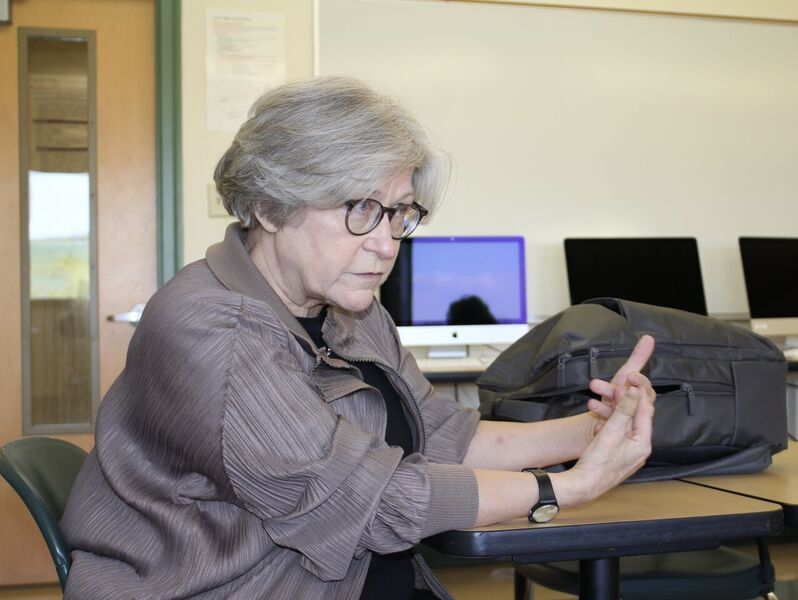 “Most degree programs are offered only at the graduate level, and the majority of those programs are very theoretical in nature,” said Claire Ziamandanis, a professor of Spanish certified by the American Translators Association, who teaches in the translation program. “Those are great options for someone who wants to teach translation, but not necessarily for someone who wants to be a practitioner. “Our certificate will provide documented credentials, so that our graduates can begin working in the field immediately,” she added. 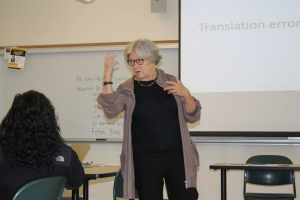 On the day of Durban’s visit to several Spanish-English translation classes at Saint Rose, Durban told the students that people in her field tend to employ similar skills, regardless of the country they work in. And more often than not, she added, the job is rooted in a deep appreciation for the language they grew up speaking. A Voorheesville native, Durban lives in Paris and translates for large companies that wish to draw investors and generate jobs. Her assignments range from months-long multi-platform campaigns to a quick turnaround of materials. Regardless of the scope, she said the challenge often involves parsing just a few words. More tricky, and intriguing, are English-language translations that are not incorrect per se, but not exactly right. To demonstrate, Durban turned to a project she did for a large transit client. A video showed images that communicated speed and efficiency. Then, she asked students to comment on the text labels, which were in English. Some simply struck the wrong note. ← How Do I Tell My Friends and Family I’m Too Busy with Grad School to Hang Out?